More of our customers are now using them to engage their users into mobile live content creation, streaming and consumption. 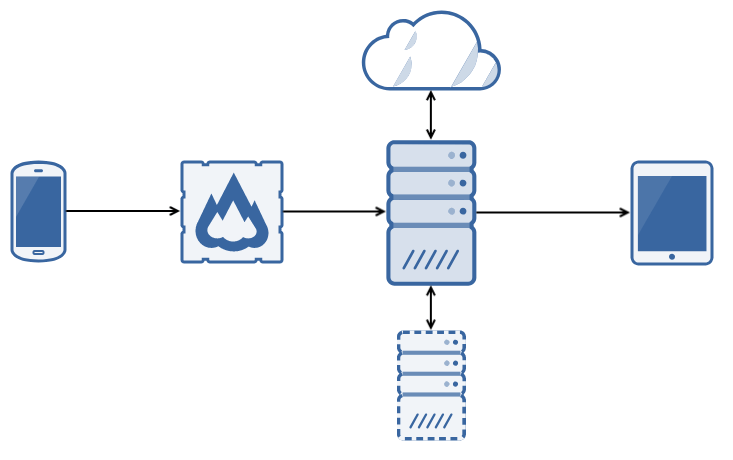 Let's see a typical architecture of such mobile production and delivery network. Click on an element name to get more details. You can also go to Snapshots webpage to see more case studies. Larix Broadcaster free application bothAndroid andiOS. Larix mobile SDK to create your own app. Larix SDK has source code for Larix Broadcaster and other sample projects for various use cases. You may subscribe formobile SDK for as long as you need our updates and support. Get more details on Android setup, iOS setup and SRT setup. Learn more on mobile solutions page. Before your RTMP or RTSP live stream gets into processing, you may want to use publish control framework for Nimble Streamer media server to manage all incoming connections from your customers. You'll create a handler application which will be able to deny un-wanted connections according to your own criteria and also disconnect any active publishers if they break your rules during the streaming process. Nimble Streamer is a software media server which allows processing any kind of incoming streams and deliver the result to multiple viewers or to other servers. When mobile stream gets in, it's transformed into any protocols supported by end-user devices. Nimble Streamer is a freeware. If you'd like to use WMSPanel for controlling Nimble Streamer or get some stats, you'll need to subscribe for it. You can check RTMP playback setup details and SLDP setup details how-to articles to see some examples of usage. WMSPanel is a cloud control panel where you can set up Nimble Streamer and Live Transcoder behavior. It's a web UI available in any browser on any device. This web service also collects stats and provides detailed info about content consumption. WMSPanel is available on 2-weeks trial period, its monthly subscription price starts from 30 USD per month. This a premium add-on for Nimble Streamer which allows transforming the content. The most popular use case is to downscale the original stream to lower renditions. This is especially useful for cases when your user streams high-quality stream while your viewers may have low-bandwidth mobile connection. Read more about Live Transcoder and check step-by-step video tutorial for creating ABR streams. Each Live Transcoder instance requires a license available at monthly subscription. Your mobile viewers may use SLDP Player which allows playing RTMP and SLDP with ultra-low latency. SLDP playback supports ABR switch with low delay. AVC/H.264, HEVC/H.265, VP8 and VP9 video codes are supported depending on user platform. You may use SLDP Player free apps for Android and iOS, or just build your own with our player SDK for Android and iOS.